“Acer Chromebooks are already seen as a proven platform for successful student learning, as they are being used by students to collaborate, conduct research and work on projects in exciting new ways,” said Eric Ackerson, senior product marketing, Acer. Acer today expands its line of Chromebooks for the education market with two new models, the Acer Chromebook C910 and Acer Chromebook C740. Both new models have a durable design and provide an affordable, easy-to-manage and proven platform for student learning. The new Acer C910 and C740 can be seen today through January 24, at BETT 2015 in London in the Acer Booth #F188. Knowing that students can be especially harsh on their devices, the Acer C910 and C740 Chromebooks 15 were designed with extra durability features. The C910 and C740 both have reinforced covers that can withstand up to 60kg of force, while the corners can tolerate up to 45cm drops without damage. Also, the hinges have been reinforced, so the new Chromebooks can endure more twisting and stress. It is likely that the C740 Chromebook will be frequently moved thanks to its compact size, so Acer designed it with extended metal hinges that keep the device more rigid in case a student mistakenly picks it up by the display or crams it in a backpack. The Acer C910 and C740 keep data safe, since they support multiple user sign on. Students simply log onto their unique accounts to ensure their project, Gmail and other information is kept safe, even if the Chromebook is lost or stolen. Storage on Google Drive protects files, documents, and photos safely in the cloud, and ensures that the most current version is always available(2). Customers can also access files offline, and even open and edit Microsoft® Office documents as well as Google Documents. The Chrome O/S is automatically updated and guards against ever-changing online threats, such as viruses and malware. This is especially useful for teachers and school administrators who are responsible for protecting students. The new Acer Chromebooks each have a Kensington lock, so they can be secured to a wireless cart or lab. Administrators will find setting up and managing Acer Chromebooks to be intuitive and efficient. The web-based management console allows remote management of apps and policies across all Chromebooks in the network(3). U.S.-based Acer Premier Care also is provided to Acer education and business customers purchasing Qty 100+ units. These customers receive dedicated service and support via their own direct phone number, which automatically places them at the head of the call queue to help address their needs. These Acer customers can also take advantage of the Acer Educare Warranty Programs to further protect their investment with solutions such as battery replacement, paid two-way shipping, and accidental damage protection(7). The Acer C910’s large 15.6-inch display is the ideal size for students to share in classrooms and labs. The crisp and vibrant display comes as either a full HD IPS (1920x1080 resolution) with wide viewing angles or HD (1366x768 resolution) option to meet the budgets of schools. Both the Acer C910 and C740 have Acer ComfyView displays, so they have anti-glare properties that minimize the amount of reflecting light for less eye strain on students and allow them to use their Chromebooks in more places around school for learning. Students can take part in Hangouts and will enjoy video chats on the HD web cam enhanced by the excellent audio and video capabilities. The new state-of-the-art processors pair with a solid state drive (SSD) for fast saving and accessing of data. The keyboards were designed for an excellent typing experience for students, some who are still learning keyboarding skills. Both new Chromebooks are easy to take along. The Acer C910 weighs only 2.2kg (4.85 pounds) and measures only 393w x 256d x 24.2h mm (15.4w x 10.08d x 0.95h inches). The Acer C740 weighs only 1.3kg (2.87 pounds) and measures 288w x 204d x 20.05h mm (11.34w x 8.03d x 0.79h inches). The Acer C910 and C740 keep students connected with up to three times faster wireless connectivity via fast MIMO 2x2 Wi-Fi 802.11ac. Students can connect other devices to the Chromebooks via Bluetooth 4.0, or by the USB 3.0, USB 2.0 and HDMI ports. The SD card reader enables a way to access and transfer files. 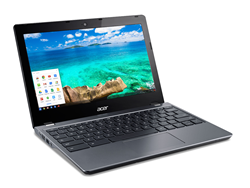 The new Chromebooks for education customers will be available in February through Acer authorized retailers. In the United States, the Acer C910 will be available with either a 16GB or 32GB SSD drive and 4GB of RAM starting at $299.99. (5) The Acer C740 will be available with a 16GB SSD drive and either 2GB or 4GB of RAM and starts at $259.99. Exact specifications, prices and availability will vary by region. Established in 1976, Acer is a hardware + software + services company dedicated to the research, design, marketing, sale and support of innovative products that enhance people's lives. Acer's product offering includes PCs, displays, projectors, servers, tablets and smartphones — tools our customers need to explore beyond limits and experience more. Acer employs 7,400 people and ranks No. 4 for total PCs globally(6).Revenues for 2013 reached US$12.02 billion. Please visit http://www.acer.com for more information. 1. Q3 2014, Gartner data, worldwide markets. 3. Google Console is sold separately, and/or may require a monthly activation fee. 4. Battery life may vary depending on usage. Actual battery life varies depending on product specifications, computer settings and applications or features launched. All batteries’ maximum capacity diminishes with time and use. 7. Limited warranty agreement applies. For a copy, write to Acer Customer Service, P.O. Box 6137, Temple, TX 76503.